Reston, Va. – A study published in the February issue of The Journal of Nuclear Medicine demonstrates the potential of extending peptide receptor radionuclide therapy targeting the somatostatin receptor to other types of malignancies beyond neuroendocrine tumors (NETs). The theranostic pairing of Netspot (Ga-68 DOTATATE, which is FDA-approved) and Lutathera (Lu-177-DOTATATE, currently under FDA review) has already shown that it can significantly improve progression-free survival in patients with somatostatin receptor-positive NETs. In contrast to NETs, non-NET tumors, such as breast cancers or renal cell cancers, are not routinely imaged with current somatostatin subtype 2 receptor (sst2) agonist radiotracers (which fully activate the receptor to which they bind and are subsequently internalized). This may change with sst2 antagonist tracers (which bind to the receptor but do not activate it and are not internalized). There is recent in vitro and in vivo evidence that somatostatin receptor sst2 antagonists could be even better tools to target NETs than sst2 agonists, as antagonists bind to a greater number of sst2 sites than agonists. In this study, the researchers compared quantitatively iodine-125 (I-125)-JR11 sst2 antagonist binding in vitro with that of the sst2 agonist I-125-Tyr3-octreotide in a variety of cancers, including prostate, breast, colon, kidney, thyroid and lymphoid tissues. NETs were included as a reference. The researchers report that 12 of 13 breast cancers, all 12 renal cell carcinomas, and all 5 medullary thyroid cancers demonstrated high binding of the antagonist. In contract, the agonist exhibited low binding in the majority of cases. In 15 non-Hodgkin lymphomas, many more sst2 sites were also labeled with the antagonist than with the agonist. Other types of cancer tested were not as responsive. In 14 prostate cancers, none had sst2 binding with the agonist, and only 4 had a weak binding with the antagonist. None of 17 colon cancers show sst2 sites with the agonist and only 3 cases are weakly positive with the antagonist. In the various tumor types, adjacent sst2-expressing tissues such as vessels, lymphocytes, nerves, mucosa or stroma were more strongly labeled with the antagonist than with the agonist. The reference NET cases, incubated with a smaller amount of tracer, were also found to have many more sst2 sites measured with the antagonist. 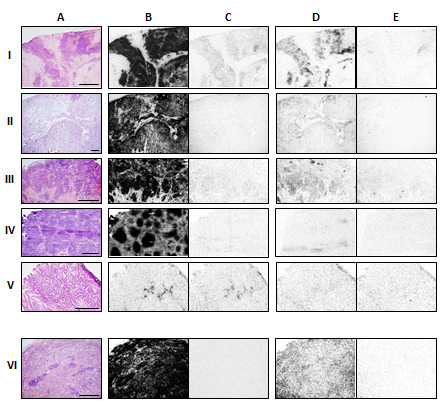 Figure Caption: Comparative receptor autoradiography in various cancer types (A = HE staining) with I-125-JR11 (B+C) and I-125-Tyr3-octreotide (D+E). B and D are the respective total binding, C and E the respective non-specific binding. Bars = 1 mm. I: Breast cancer. II: Renal cell cancer. III: Medullary thyroid cancer. IV: Non-Hodgkin lymphoma. V: Colon cancer. In cancers I-V, the sections were incubated with 30’000 cpm/100 μl of antagonist or agonist. Cancers I-IV show a much higher density of sst2 with the antagonist. The colon cancer V is negative. VI: Ileal NET, incubated with 10’000 cpm/100 μl of antagonist or agonist. Credit: Jean Claude Reubi, Institute of Pathology, University of Berne, Berne, Switzerland. Authors of the article “Highly Increased 125i-Jr11 Antagonist Binding In Vitro Reveals Novel Indications for Sst2 Targeting In Human Cancers” include Jean Claude Reubi and Beatrice Waser, University of Berne, Switzerland; Helmut Mäcke, University of Freiburg, Germany; and Jean Rivier, The Salk Institute for Biological Studies, La Jolla, California. This study was funded in part by support from Octreopharm Sciences GmbH, Berlin, Germany.